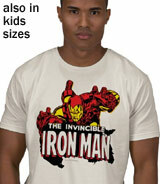 The design on this popular Iron Man merchandise item displays a vintage Invincible Iron Man design. The character's metal red and gold exoskeleton is made of a gold titanium alloy. This contradicts the name Iron Man, which the media in the movie gives to the character. Tony Stark replies that he still likes it anyway, even if the "costume" is not actually made of iron. The design on these vintage Iron Man t-shirts is perfect for fans of the superhero.